Savion Glover has a new show at the Joyce Theater. In conjunction, tap dancer and cast member Marshall Davis Jr. discusses what it's like to dance with Savion Glover and also talks extensively about his career. A protogé of Steve Condos, Marshall Davis talks about his training in Miami, winning Star Search and what it was like to be the drum major in a marching band. Savion Glover’s new STePz is shrouded in mystery—the show promises to take tap dance to new heights, as usual—but one thing is for sure: It won’t be dull. Joining the talented Glover at the Joyce Theater beginning Tuesday 18 are dancers Ayodele Casel, Marshall Davis Jr., Robyn Watson and Sarah Savelli. For Davis, who has been dancing with Glover for many years—he was a cast member of Bring in ’da Noise, Bring in ’da Funk—the premiere is another opportunity to make sound matter. A protégé of Steve Condos, the Greek-American dancer acclaimed for his speed and musicality, Davis—a Star Search champion­­—spoke about his impressive career. Time Out New York: How did you get started in dance? Isn’t your father the director of an arts organization? Marshall Davis Jr.: In Miami, my father is the director of the African Heritage Cultural Arts Center, and when I was about six or seven, we would go there because they have a summer arts program. We would take classes; the program is set up for parents to drop their kids off. So we were there from 7am until about 6pm taking classes in dance, drama, music and the visual arts. As you got older, you could have electives and that’s how I got started in dance. Originally I was playing the African drums—the congas—in African class. I was about seven or eight. Eventually, they added tap to the curriculum, and I started taking tap classes. My father was a little reluctant to buy me shoes at first because I was going through so many phases, and he had bought me different instruments—a guitar and a keyboard and stuff like that—but I convinced him to buy me a pair of tap shoes. I’ve been tap-dancing ever since. Time Out New York: How old were you? Marshall Davis Jr.: I was ten. Time Out New York: Did you study other dance forms there? Marshall Davis Jr.: Yes. Before I even started tap-dancing, I studied African, jazz, modern and ballet. Time Out New York: Did you prefer one? Or was music more important at that point? Marshall Davis Jr.: Actually what made me want to take the dance classes was that I saw that’s where all the girls were. [Laughs] I was more into music, and I would walk by and see all the girls in the dance class in leotards and tights, and I was like, I want to go to that class. Most of the time I was the only guy in there. But that made it better for me. Time Out New York: Did you have a problem wearing tights? Marshall Davis Jr.: Well, we didn’t really wear them in the beginning. It was more just shorts and sweatpants, but I remember for one performance I did have to wear tights and I was like, You can say what you want—I’m the guy with the girls. [Laughs] I didn’t care what the guys said. So that’s how I got into dance class. It wasn’t bad. The movement was interesting. But once I started tap-dancing, I found there was more of a freedom. I could express myself through it. I wanted to tap-dance before I started taking tap classes, but I never expressed it to my parents. I remember watching Gregory Hines and Maurice [Hines] on Sesame Street, and that is my first recollection of seeing tap dancing and knowing that’s what I want to do. I never said it. I would take class in my sneakers or some type of dress shoe, so I could get sound, but that’s how much I was into it. I didn’t really care about having the shoes. I wanted to learn. Time Out New York: For you, tap is the union of music and dance. Are you grateful that you had early music training? Marshall Davis Jr.: Definitely. I continued with music classes later on. Once I started taking basic classes at the cultural-arts center, I met Steve Condos and that’s when my life changed. I went in a totally different direction of how I approached tap. Time Out New York: How did you first meet? Marshall Davis Jr.: The first time I met him, I didn’t know who he was. I was dancing for Dizzy Gillespie’s birthday party in Miami and Steve Condos was there, and the guy I was dancing with at the time knew who he was. I had been dancing only for four or five months. Steve and Dizzy were very close friends so the next time I met Steve was when the movie Tap came out. There was a big contest called the Tap Day challenge; they went to each state to find the best tap dancer. There wasn’t an age limit. From there, they had the national competition in New York, where all the tap dancers competed. Steve was living in Hollywood, Florida, at the time. He was a judge for the competition. My parents asked him if he would be willing to work with me. He said, “Let’s see—after the national competition in New York, I’ll let you all know.” I didn’t win the national competition, but he agreed to work with me. But I had no idea. My parents woke me up on a Saturday and said, “Get dressed and bring your shoes.” At that time, you didn’t question anything—whatever they told you to do, you just did it. They knocked on the door and Steve opened it and I was in shock. That was our first lesson. I remember being in the room where he practiced on a board that was about two feet by four feet, and we were just working out and that was it. Then every Saturday when his schedule permitted it, I would go to his house and we would have class. Time Out New York: How long were the classes? Marshall Davis Jr.: He would dance for hours. He believed practice, practice, practice: “Make practice your best friend.” I knew the time was up when [his wife] Lorraine would come in and say, “Steve, I think he needs a break.” That’s when she would fix me a sandwich or make me some ice cream or something, and then they would call my parents. Time Out New York: Why was Steve Condos so important? 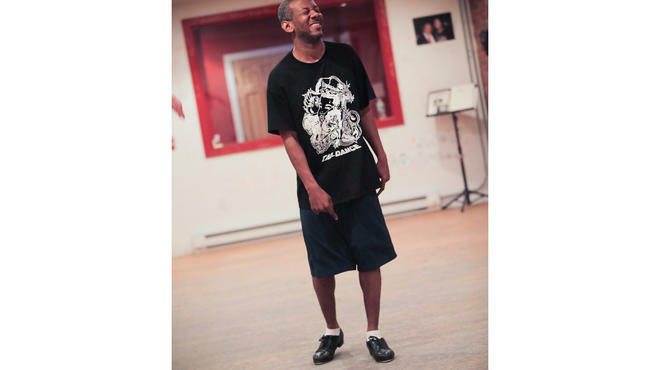 Marshall Davis Jr.: I feel like I really started to understand tap dance as a way of life. Initially, it was something I was interested in as a hobby. I never intended to make a career out of it. It became a way of life for me once I met Steve. I was able to become a better person through tap dancing; I understood things about the art that I could relate to my personal life, and then I understood things about my personal life that I could relate to the art. So they went hand in hand. As I grew in the dance, I grew as a human being; as I grew as a human being, I grew in the dance. A lot of that had to do with Steve—understanding the musicality, the rhythm. Still knowing how to present it, but knowing that you have a choice in how you want to present it, and how you want to express yourself through the art form—again, the individuality, the uniqueness. He always told me, “I’m sharing these things with you, but now you figure out how you want to do them for yourself so you can develop your own voice.” He told me not to imitate him. Time Out New York: But as a young dancer, that’s how you learn at first, right? Marshall Davis Jr.: Yeah. It’s almost a genetic thing. You have characteristics of your parents because that’s who you grew up around. Even if you didn’t, you find those things that are a part of yourself, so I felt that was part of the connection. But still I noticed in going back and looking at old footage—even though I’m using the rudiments of what he taught me, what he would do rhythmically is totally different than how I’m using the rudiments. He always taught me not to be complacent. He said, “If you think you’re good now, imagine ten years from now; if you continue to practice and work on it and imagine ten years from that.” So as a kid, really imagining it, I was like, Whoa. And then he said, “The next ten years…,” and I was like, Okay this is something I really have to work on, but it let me know that the process of learning and growing never stops. No matter how good you think you are, there’s always room to grow. Time Out New York: How would you describe his musical approach? Marshall Davis Jr.: He was known, later on, for double time, but that was just his preference. I always refer to it as a writing style. Terry McMillan writes differently than Stephen King, but they’re still using the English language: capital letters, spaces in between words. But that was his approach of dealing with the accents and getting to complex rhythm patterns. Time Out New York: Was it hard for you to understand what he was doing or did he break it down? Marshall Davis Jr.: He broke it down, but while telling me, “You can do what you want as long as you know what it is that you’re doing.” I started to understand musicality, how to make things fit inside of those rules. When you understand that, you can make whatever choice you want. But understand where you are: This is a chorus of music. Now inside of this, you can do this or that. Think about it and come up with your own approach. Time Out New York: How do you approach it now? Marshall Davis Jr.: Oh, man, it’s just seeing the different patterns and possibilities inside of whatever that time it is that I’m dealing with. It’s going into the different groves and different fields, but still trying to maintain that time and seeing how I can—I don’t want to say manipulate but—go off into the crevices and cracks.